We here at Laminex New Zealand’s Taupo Manufacturing Plant have been using Ashley Cho I.T. Solutions for the past couple of years and it has been a very positive and rewarding success story. On site we had numerous databases and spreadsheets all collecting data. Each morning this had to be collated into a single report taking several hours. Stewart from Ashley Cho built us a single database which pulls all our data into one place and generates the much needed reports. It starts with an easy to use interface for the team in the plants to input data and culminates in all the data for our daily operations meeting taking around 20 minutes to put together into a PowerPoint presentation instead of the previous 2 hours it used to take. With further refinements in the works I have no doubt this will only get better as we spread the database into other areas of the sites operations. Along with the software side Ashley and the team have set up on site servers with a backup system in place so we no longer have to rely on what is sometimes a tenuous connection to the company network and so our data is safe and just as importantly current and correct. Whether hardware or software I thoroughly recommend Ashley and his team. Nothing has been an issue for them and we are very happy to continue our association with them. Isn’t it great when you find help that just fits your needs and expectations. My daily work is carried out on computer and with the deadline driven business that I am in it is really important that I deliver work to my clients on time, every time. So when I moved to Taupo and needed technical help I phoned Ashley Cho. 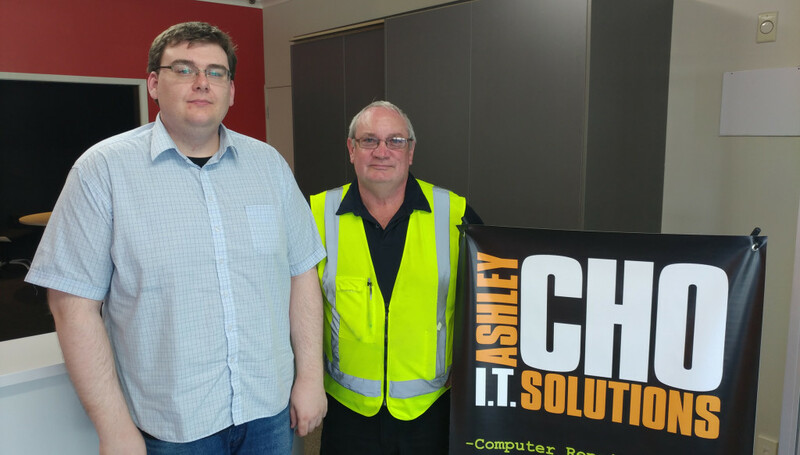 Ashley was like a breath of fresh air… he spoke in a technical language I could understand, spent time explaining and sorting things and quickly became my trusted ‘go to’ I.T. guy, all at a price that I consider quite reasonable. Throughout my twenty six years of daily computer use I have never received anywhere near that high level of I.T. support and I’m never kept waiting. Ashley’s business has since grown (easy to see why) but his personal dedication has not stopped and although most of my ‘issues’ are now efficiently attended to by Liam, Ashley is still always accessible. I can’t recommend Ashley Cho I.T. Solutions highly enough. I have used Ashley Cho's service for the last 2 years. This has made my life much simpler than at any time in the last 20 years. I now don't panic when something strange happens with my systems, I just contact Ashley and his team and continue with my business. This is priceless for a small business like mine with a home office. I need the expertise when I need it and they always find the answer, even with an old CRM programme that I use which is no longer supported by the designer because continuous updates and support are now designed for large organisations, not a sole user. Thank you Ashley and the team. Waiora Community Trust has been dealing with Ashley Cho long before Ashley Cho I.T. Solutions. Now, he and the team do the IT here at Waiora House as well as my home. They have always been there for me and ready to explain “IT” in a clear way that I can understand. Explaining and teaching is not a problem for them. . When there is a systems problem, someone is here “johnny-on- the-spot” or on the phone remoting in, getting things back up and running. In my line of work, the computer system is indespensible. Without it, my day can come to a complete stand-still. And in this business, communication is everything. I have recommended Ashley to the many organisations within Waiora House. And I am pleased to recommend the Ashley Cho I.T. Solutions Team. This is the team you want in your corner.